Reverse up-voting - Upvote by accident? Fret not, you can now take that vote back. Comment collapsing - Simply click the user’s pixel avatar next to the comment you’d like to collapse. :visited color - Easy on the eyes, yes? Don’t forget about that friendly face in the lower right corner, keep your feedback coming! I'm loving the wider layout, much more comfortable to read now! New updates are much easier on the eyes. Removing the border around the upvote count somehow helped a lot. It's better! (: Replies are still a bit messy. Indeed, the 'Markdown supported' tab shows some bugs. This site is really moving along in a great direction! Keep up the improvements. I noticed you're at Amazon. Are you in the Seattle offices? 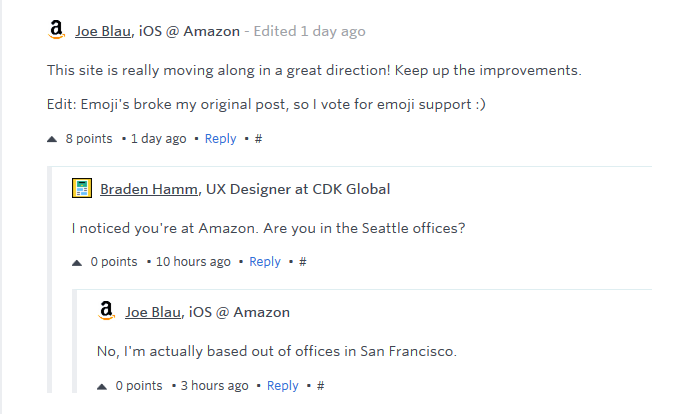 No, I'm actually based out of offices in San Francisco. – Wider layout is much better. – Less dominant upvote/downvote... I like. – :visited color is nice and subtle – Without knowing I can collapse a comment, I would never know that clicking the avatar would perform such action. Not very clear or intuitive. Comment collapsing: If a user has a blank pixel avatar then you have to guess as to where to click. Even with an avatar I don't think this action is very intuitive. I have mixed feelings about this. Are there small updates scheduled in the near future? Hey! We push updates to the site daily, but most aren't noticeable – the next few weeks should see a handful small-ish updates, and a couple larger ones. It's never too late to send in suggestions, though; just click that little guy in the bottom right! I love the roomier layout, make good use of these wide screens we have! How do you reverse a vote? Clicking the upvote button again seems to undo it for me. Not entirely intuitive--but not necessarily the end of the world for an action like that. Kudos, y'all. I love what I've seen so far. That's great - love the wider layout. But how about support for Safari? Have all the bugs been fixed? Also, I have to agree with @Pedro Ivo Hudson that comments are still a bit messy. One place to start would be to alternate the background of comments so it's easier to scan through. The reply lines also don't work that well, especially when a lot of people write several long comments and start a conversation, but I don't have any ideas about how to fix this. Mentions are also something I would like to see. It'd be cool if the nested comments were more obvious. This would require some vertical space to be added to keep the padding rules intact but it could work. Nice one. Totally agree, those margins/paddings would need a little love. Glad to hear it - I do like how the site is shaping up. What about the Safari problems? It seems to be working well so far. I'll let you know if I find any more problems - Thanks. The comment collapsing is a great addition… just not at all learnable or intuitive. Perhaps consider other treatments to show this? Or at the very least, a hover state (but touch-devices will be sad pandas). Max, stop forgetting your password! Awesome, thanks for the :visited color change! Much better, now! Thanks for the effort! Search function doesn't work on Firefox 40.0, nothing happens when I press enter. Perhaps you should add 'Search' button? So nice, guys. Thanks for pushin' the platform forward. Thanks Surjith... got a couple bugs we're sorting through in Firefox. Glad that the left sidebar has been moved. Much better hierarchy now! This is definitely better. Just an Idea, could you just grow the "upvote comment" clickable area ? and don't forget about the downvote hotkey feature. Please integrate a markdown preview. I'm sure many people use chrome plugin but it's a need! Now if you could make non-www work or at least redirect, I would be so happy. Looking cool! Love the new layout and the dropdown search bar and sub nav. The tap area of the menu hamburger seems to be limited to its strokes rather than an enclosing box. Is there any way to have a link to the comment in the RSS feed (like Hacker News)? I use RSS to read DN and if I find something I want to comment on I need to go to the site and look for the post, it's not great.